I do it every day... well, sure I create every day but I was talking about Coffee - lol. I love the smell, the flavor, the warm cup in my hand.. sigh. 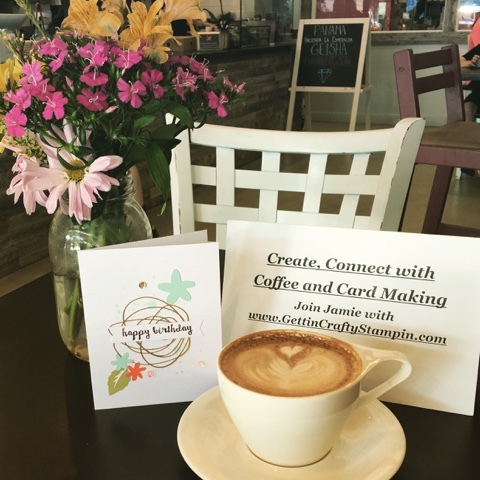 Combine it with my love of crafting and you can Join Us every Monday morning to Create, Connect over Card Making and Coffee at Ragamuffin Coffee Roasters, for free! Today we created these adorable cards using the February My Paper Pumpkin kit! I'm not a flowery kind of girl, not really. This set is so stinking cute that we had a blast creating it while we connected. Paper Pumpkin is a monthly crafting kit that comes directly to you! My kids adore creating the kits, they are that easy and fun to do. See how easy this kit was to create - then order your own kits from me. See past creations when you click here. OH and they are ON SALE right now - also giving you a FREE Sale~A~Bration item when you purchase the 3 month certificate (a wonderful gift for yourself, people with kids or limited crafting time and teachers). The kits come with every thing you'll need - the adhesive, stamp sets, inks and cards... I love it! I invite you to connect and create with me. 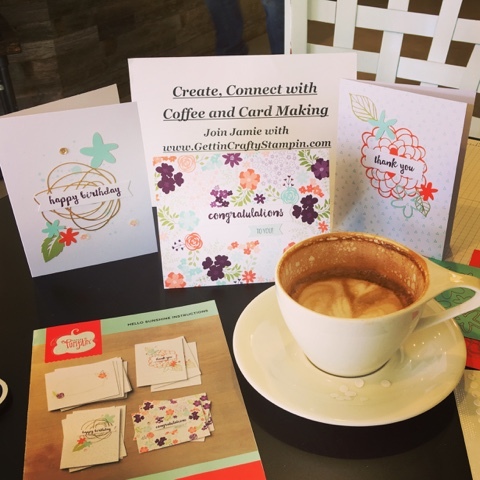 I have a calendar waiting for YOU to join us as we make friends, create works of art and bless others with a handmade card. If you can't meet up, pick our Paper Pumpkin kits to come directly to you. They have a video tutorial and even a PDF Tutorial with each kit.